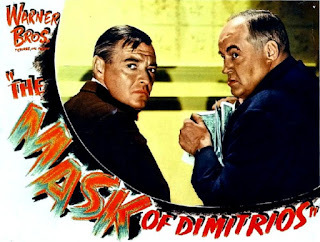 One Eternal Day: "Ingenuity is never a substitute for intelligence"
"Ingenuity is never a substitute for intelligence"
One of the great unheralded screen duos of Hollywood's Golden Era was Peter Lorre and Sydney Greenstreet, two character actors who made a total of nine films together between 1941 and 1946. The most famous of these pairings are the first two, The Maltese Falcon (1941) and Casablanca (1942), in which both men played memorable supporting roles. In his screen debut, the underrated and very versatile Zachary Scott...plays the title character, a cad and degenerate con man named Dimitrios Makropoulos, who washes up dead on a beach in Istanbul. A Turkish policeman convinces Cornelius Leyden (Peter Lorre), a Dutch mystery novelist, to dig into the life of the deceased, promising that what he finds will fuel a great book. Intrigued, Leyden travels all over Europe tracking down and interviewing the many sordid associates and lovers of Dimitrios, all of whom remain bitter by his betrayals. The most intriguing character, however, is Mr. Peters (Greenstreet) an amiable, dishonest, and sometime dangerous criminal who seems as interested in Cornelius as Cornelius is in Dimitrios. Another great Ambler book filmed about the same time, with at least one of the same chracters, was Journey into Fear starring Joseph Cotton. This film has also been unavailable on DVD and deserves to once again become available.